Siwertell, part of Cargotec, has secured an order for a rail- travelling unloader from South Korean company Daelim Industrial Co Ltd. The unloader has been ordered as part of an expansion programme at Pagbilao coal-fired power- generation plant in the Philippines.The order was booked into Cargotec’s third quarter order intake 2014, with delivery scheduled for October 2016. Pagbilao Energy awarded the contract for the site’s third coal-fired unit to a consortium comprising Mitsubishi Hitachi Power Systems Ltd, Japan and Daelim, responsible for the project’s coal handling system. “The ST 790-D unloader is designed to discharge coal from vessels of up to 92,500dwt at a rated capacity of 1,400tph (tonnes per hour). With its continuous operation, it will offer an unbeatable through-the-ship capacity while delivering environmentally friendly operations with minimal dust and no spillage,” says Jeppsson. The unloader will be completely assembled before delivery at the premises of a Siwertell subcontractor in Nantong, China. It will then be shipped in one piece to the Philippines. Final testing, commissioning and training will be carried out by Siwertell engineers on site. “There are plans for several new coal-fired power plants in the Philippines, along with more expansion projects for existing plants.Therefore, this market is very important for us now and over the coming years,” Jeppsson adds. Siwertell ship unloaders and loaders are based on unique screw conveyor technology, in combination with belt conveyors and aeroslides, and can handle virtually any dry bulk cargo, such as coal, cement, fertilizer, agribulk, clinker, sulphur and grain. 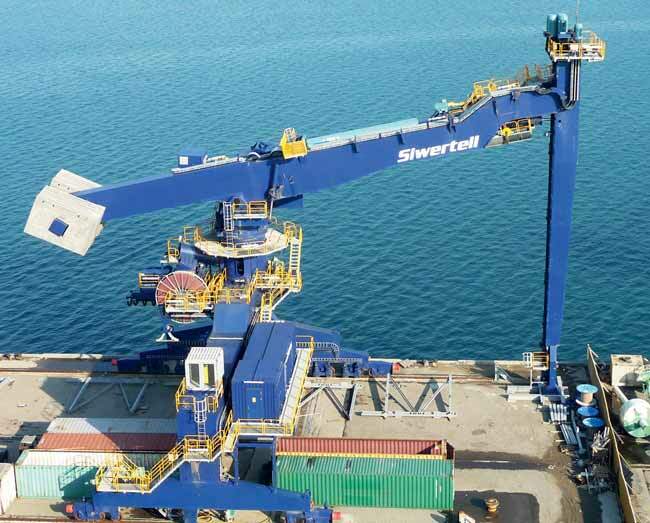 Siwertell plant and terminal design, ship unloaders, ship loaders, mobile ship unloaders, mechanical and pneumatic conveying systems, and storage solutions are all designed to ensure environmentally-friendly and efficient cargo operations.